I’m sure we can all agree that it’s a good idea to try to eat at least one vegetarian meal a week (if for no other reason than it’s massively cheaper to make) and this one is ideal for serving to the family. I made these crispy chickpea wraps one night when my (meat-eating, T-Rex-beating in the carnivorous stakes – excuse the pun) stepsons came for dinner and they didn’t realise it was a vegan meal until I told them so after they had finished eating because they thought it was so tasty and satisfying. I flavoured my crispy chickpeas with a homemade Mexican spice mix of ground cumin and paprika, but if you want a handy, easier option Casa de Sante makes a great Mexican Spice Mix that’s officially certified by FODMAP Friendly and can be used in loads of meals, such as fajitas and burritos. You can buy it online by clicking the link here. I think one of the reasons these crispy chickpea wraps are so good is because there is a gorgeous contrast between the crispy chickpeas, the tender corn tortillas, the crispy, crunchy fresh salad and the smooth grated cheese. 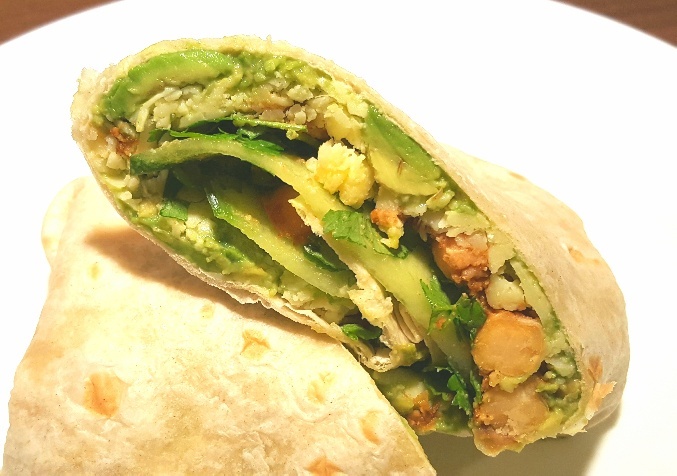 I served my crispy chickpea wraps stuffed full of fresh green salad, slices of cucumber, a little mashed avocado and grated (non-dairy, in my case) cheddar cheese. They’re just a really tasty dinner option. Put the sesame oil, maple syrup, soy sauce and lime juice in a large frying over a medium heat and add the chickpeas and spices. Fry the chickpeas until the liquid has evaporated and the chickpeas are crispy. Mix your dressing ingredients together until smoothly blended. Heat up your corn tortillas, spread each tortilla with some of the dressing and add the chickpeas and salad before wrapping up into a burrito. Serve with chopped fresh chilli, a small serving of avocado (20g is a low FODMAP portion per person), slices of cucumber, salad, cheddar cheese or a dairy-free version, freshly chopped coriander, salsa, sour cream, jalapenos etc.